Reading the title for this movie, which should’ve just been a clean and neat Mission Impossible 5, is enough to induce a headache. You need a hooked on phonics refresher just to digest it. However, that’s not how the movie unfolds. Not at all. This is the definition of the summer’s tail end of moviegoing fun. It’s action-packed with a few ounces of the upcoming fall’s fascination with the cerebral. 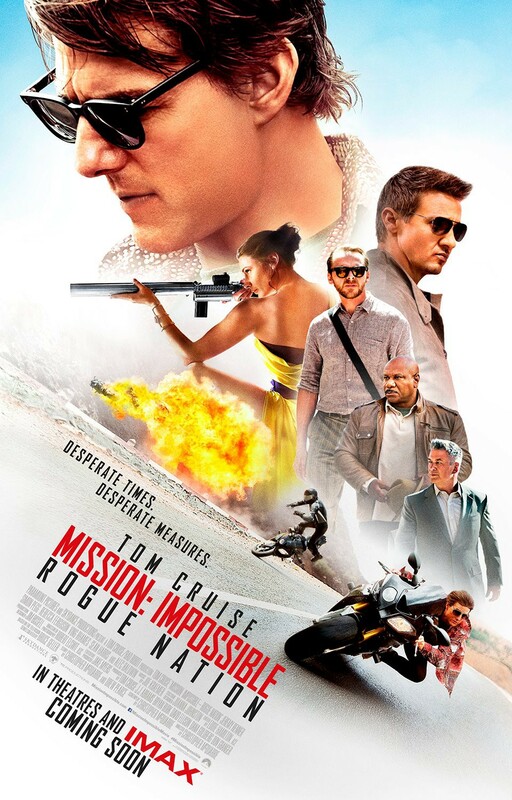 Rogue Nation is convoluted and messy with subplots which add length but not depth, and all the while, its stars leave us chasing mission after mission. Licking our chops to see them fail, and as is always the case, ultimately rise. This is the fifth adventure in the franchise that is the same exact storyline told five different ways. 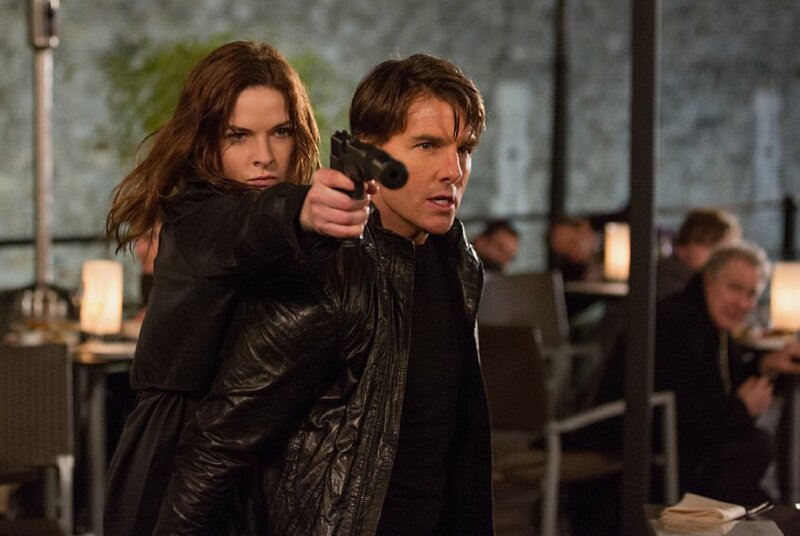 Mission Impossible 5 is so well made and so tidy that the events never feel insurmountable, no matter the number of locks to be broken or bullets to be dodged. This is big screen entertainment to a tee, and should be seen in IMAX format if possible. There are some REM inducing lulls, but the set pieces sure do shock you back to life. 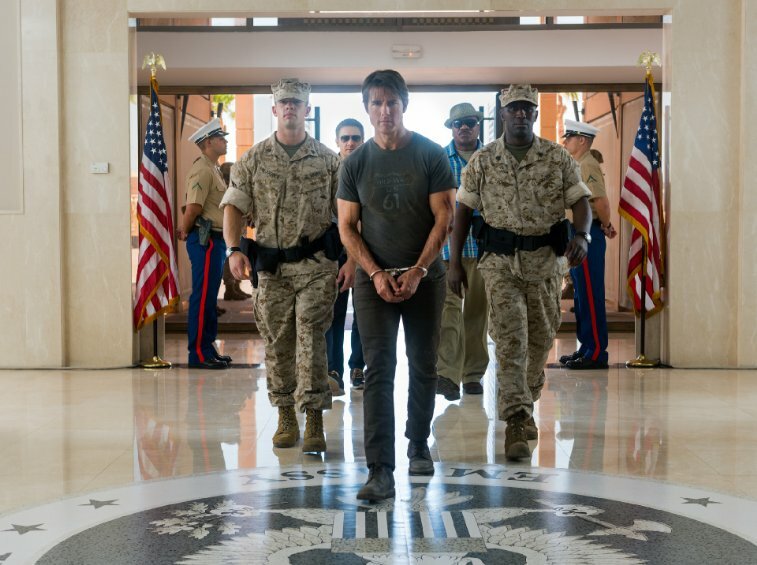 IMF Operative Ethan Hunt (Tom Cruise) has a mission…and it’s “impossible.” Yadda Yadda Yadda. This is the fifth time; we get it by now. Save the redundancy. It’s like having a girl scout knock on your door every single day, turning them down, and then finally saying yes in hopes that they don’t come back until next year. You sit there with this movie, with your Caramel deLites, and fall into a surgically sugary state. By time’s end you’ll feel the pain of the landscapers you drive by in your cozy suburban neighborhoods pruning and clipping in the dead heat of August. This puts in that same amount of effort tenfold, yet the results still pour over from piece to piece, from edged landscape to precisely trimmed hedge. Rogue Nation is all thrills and frills with no time for “oohs” or “ahhs.” It lacks emphasis but is never short on things to be emphasized. Every spy movie needs a bad guy, and fortunately for this one they have a solid character played a strong actor. Sean Harris is Soloman Lane, the overseer of The Syndicate, an anti-IMF operation of rogue agents. Harris plays the part in an understated way; he neither owns nor disappears from the story. Still, afterwards, it’s hard to shake his quietly hushed grimace of gloom. Lane perpetuates his plan through British turncoat Ilsa Faust (Rebecca Ferguson). Her allegiances are unclear and muddled, giving the story a bit of a political conspiracy thriller angle to go along with its dialed in focus on spectacular action. Ferguson gives the movie personality and vulnerability, and without her the story would have acted as its own solute and solvent, dissolving into nothingness. 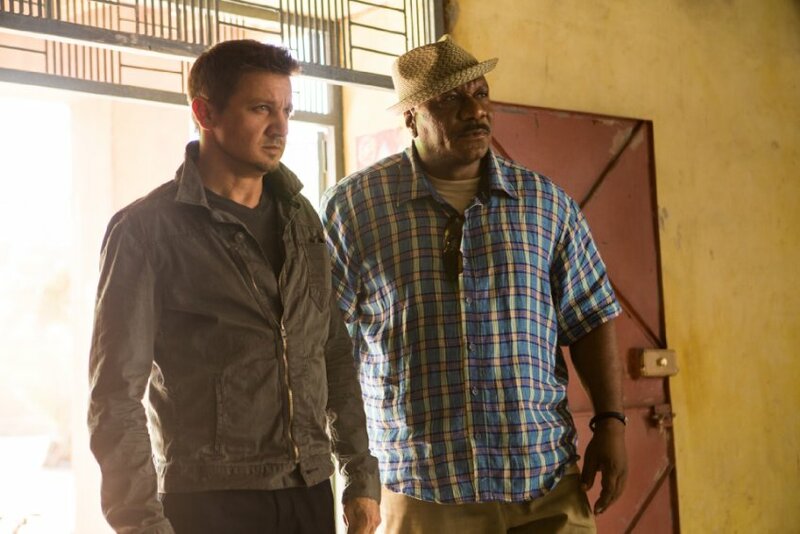 The rest of the cast is rounded out with a stellar group: Jeremy Renner, Ving Rhames, and Alec Baldwin. 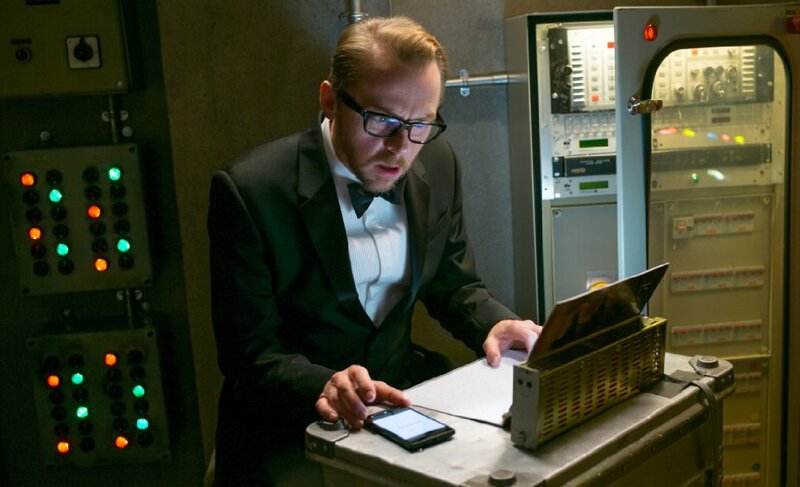 All are good but none memorable, save for Simon Pegg, providing some much-needed laughs only present in the movie’s second half. No matter how you look at it though, this is Tom Cruise’s movie. Even at the age of 53, when most men have become globs of slow-running glue reclined in their aptly named La-Z-Boy’s, drinkin’ a cold one and watchin’ the game, he remains one of our absolute best action stars. His charisma is pure, his athleticism undeniable, and his devotion unparalleled. Ask another actor -any- to strap themselves to the side of plane for 8 takes and you would be laughed at. In an interview with Jimmy Fallon, being his own congratulatory self and wowing at Cruise’s craziness, the actor replied with a line that says everything you need to know about him. “I just want to entertain you all.” Like him or not, it’s clear that few, if any at all, have done it better than him. The evidence is irrefutable. Rogue Nation is, as you might have guessed, a movie that revolves around action. As such, the moments in between become routine, almost meaningless. The dialogue has no characterization, no uniqueness to the person saying the words. We want the next big thrill and twist and explosion because we know that it’s coming. Christopher McQuarrie directs the action with a kind of silent finesse, refusing to let a drowning score interfere with the events on-screen. It’s rigid in its visual landscape while also fluid in the shooting style. In that regard, the film stunningly pulls off a sense of silence and observance which never interferes with the overwhelming spectacle of it all. McQuarrie does plenty of good, but he has too much plot to work with; there is a lot of fat here. By the end I felt as bloated as a tryptophan induced post-Thanksgiving coma. The more weight you add to the physical self, the more exhausting the mental exercise becomes. You want to give up sooner, to throw in the towel faster. And yes, I understand those parts are “formalities” in this genre, but they are also parts of the movie as a whole. That’s like getting in a car that doesn’t run and saying, “But did you see the paint job!” Mission Impossible 5 is a fun movie, and it’s not very smart, and I wish it had embraced its enjoyable sense of stupidity, luck, and coincidence. Regardless, if you have a sweet tooth for action, you’re in for one hell of a treat.